The Boulder CTO Lunch meets once a month with a guest speaker and covers topics and questions that startup CTOs should find interesting. This month, the group had Jud Valeski, who is currently the CTO at Gnip. Prior to Gnip, Jud started his professional career in technology at IBM as a software developer. In the past ten years he has spent about five of them coding (primarily C/C++), and about five of them in technical team management/director capacities. The bulk of his experience comes from Netscape Communications (acquired by AOL), with varying durations at IBM, Microsoft, and onebox.com (acquired by OpenWave). I will share highlights of the discussion, but since this was a open, free-formed discussion, I am sure I couldn’t capture everything and not all my notes are completely accurate. Some of the notes also come from participants in the conversation and are not necessarily held by the discussion leader. A question we ask each visitor, every month, What is a CTO? we do this because every CTO has a different answer. “The title is pretty much irrelevant to me.” At a small company it doesn’t matter. It means something, it means a lot, at larger companies. Jud is a developer turned CTO, he explains this can be hard for some because a CTO brings some management responsibilities, which doesn’t always come naturally to all developers. If you come from only management experience you can have a hard time with the CTO role because they don’t have the technical depth to make these decisions. CTO role embodies the sense of leadership. As CTO, you need a complete understanding of the business. If the CTO is scattered that can be fatal. Be clear with prioritization and direction. If a person in the leadership position is confused it leads to a lack of confidence. CTOs need to always be able to draw the system architecture. If you can’t, you are too detached. To show those around you that you know what you are doing, you have to get down in the trenches and make some low level decisions with them. Backing up the decisions by explaining the technical merit of those choices. Push technical discussions along. Don’t let a topic be discussed too long when a decision needs to be made. Also, don’t cut off the discussion before exploring enough opportunities or you can make the wrong decisions. One thing Jud measures the most is how well the team is going. If it isn’t going well, it is his fault. A personal metric of Jud’s: if Gnip disbands tomorrow, every employee should be better and more knowledgeable than they were before they worked at Gnip. * Only hire people that are smarter than you. * If you think you are the smartest in the room, there is an ego problem and it is hurting the business. * The downside to this is it takes a long time to hire. * Gnip might hire 1 out of every 120 resumes it takes the time to seriously consider. * Don’t just hire for the tech need, the team personality and fit are just as important. * Everyone on the team has to be great people, not just in the office, but out of the office. Jud was once a part of a team that went from 15-50 in 4 months, which was too fast of growth and it was a mistake. As a CTO do you have to manage your CEO? Like any job you need to be careful about what you escalate to the boss. The CEO doesn’t want to hear about every little thing. What can a CTO do to foster engineering growth? * Let employees buy as many books as they want on the companies dime. * Force developers out of their comfort zones. What do you do about slipping schedules? If you pin motivation, success, or failure to a schedule you are doomed. Wins have to come from someplace, if you set a schedule and meet it celebrate. Reconciling schedules with business realities is probably one of the toughest CTO jobs. If you have shrink wrapped software schedules has a whole different meaning. Don’t inflate dates just to make the schedule, any dishonesty anywhere in the chain is bad. You need to be able to release internally all the time. Internally always try to release early and release often. When falling behind schedule, you have to evaluate the severity of each bug and feature. If there is a known workaround, that changes everything. If there is a workaround then it doesn’t have to block a release. If there isn’t a workaround, then you have to decide if it makes sense to have a release missing that feature. Thanks a bunch to Jud for sharing his thoughts with our CTO group. I also want to thank Tom Chikoore from Filtrbox for organizing the meetings, and Jon Fox and David Cohen who originally started our CTO lunches. The Boulder CTO Lunch meets once a month with a guest speaker and covers topics and questions that startup CTOs should find interesting. This month, the group had Sanjiv Bhargava from StillSecure come talk with our group. Before becoming VP of product development at StillSecure, Sanjiv was VP of Technology at Symantec Corporation. Sanjiv was also involved in some startups that failed and others that succeeded (selling a consulting company he founded). I will share highlights of the discussion, but since this was a open, free-formed discussion, I am sure I couldn’t capture everything and not all my notes are completely accurate. Sanjiv has worked with geographically dispersed teams in the past, but recommends working with everyone under the same roof if possible. He said that for small teams it is very helpful, as you build teams you need to build relationships. A team is a reflection of the leader, or you can switch it around, a leader is a reflection of a team because the leader builds that team. The first hire to a small team has a huge impact on corporate culture, which can be good, but be aware of it. * sometimes make a compromise on technical knowledge but not on culture and team chemistry. The corporate culture is set by who you are. For example, if your office has a ping pong table and you never play ping pong that sets a culture to never play – focus on work. To play or never play: either is OK, but your actions as a leader set it. Have an open dialog with a problem employee to figure out what is going on. Maybe things can be turned around. In small startups you need to cut your losses on employees fast and early. There is never an easy or easier time to get rid of someone. Think of the other employees you have. Good startup employees know the bad hire isn’t working out, and they don’t like having to carry their dead weight. Everyone chimed in on evaluations from the group, some of the thoughts are below. * Discuss as part of a team. What can I change? What can we improve on as a team? Have them evaluate you as a leader as well. * A quick weekly meeting. What is not going right? What is going well? Go over what goals were met from the previous week. Have a meeting to set goals for the week and the year. * It isn’t about management recognition, it is about team recognition. Group support and group recognition. * Don’t have meetings. Do it on the fly, why wait to tell someone something is awesome or something wasn’t up to par? * Ask ten different people what is the role of a CTO and you will get ten different answers. * The CTO role is decided by what fits the company. * It is a role that is a combination of business and technology. * One of the biggest mistakes we make is we try to pigeon hole people into boxes and defined roles. Thanks everyone for attending our January CTO lunch. Thanks to Sanjiv for helping lead a great discussion. Also, thanks as always for TechStars for hosting our group. If you are interested in joining our CTO lunch shoot me an email dan devver.net, and I can get you on the email list. Although I’m not actually the CTO of Devver, I had the pleasure of attending the Boulder CTO lunch this past Monday since Dan was out of town. This week, the group had Todd Vernon from Lijit come lead the discussion. Although Todd is currently CEO of Lijit, he was CTO at his former company, Raindance. The group that was assembled was small but awesome – I had the opportunity to learn not only from Todd, but also from the CTOs of a few of last years TechStars companies. The discussion touched on a ton of topics, but two (related) themes that were heavily discussed were the role of the CTO and how a company grows from a technology perspective. I’ve organized my notes below. Keep in mind that these are the collected thoughts from a number of different participants and I may not have captured their ideas with 100% accuracy. What is the difference between a CTO and a VP of Engineering? CTO is about leadership for technical issues, interfacing with the business side, guiding the product, get people excited about product from a technical point of view. VPoE is almost one step above Chief Architect, more on a management side, getting product delivered. 1st time CTOs need to figure out their exact role. It’s a very amorphous role, depending on the company. CTO needs to be able to tell the whole business story, understand the good parts and bad. Early on, CTO should insert themselves into the sales process as much as possible (especially right after you hire the sales person). You need to be able to hear what customers say they want, so you can translate that into what they really need. There is a technology onion – make sure the core of the onion is owned by company (the outer layers, not as important). The CTO needs to figure out the relationship between the technologies and the company’s partnerships. The closer a technology is to the core of the onion, the more important it is to own it and to make sure it scales. Having to re-architect a core component of a company can really hurt growth. Assume you’re going to be successful, so plan for that. Along the same lines, one concern about using EC2 is that you get tied to the platform and your business is dependent on an outside force you can’t control. Hosting on EC2 can be quite different than hosting your own boxes. What is acceptable downtime? It depends on when – between midnight to 1-2 AM, it might be OK to be down for a few minutes. CTOs need to determine what acceptable downtime is and tell that the to the rest of management and have people agree. CTOs need to make decisions (for instance, what is the acceptable down time, acceptable data loss, or acceptable time for page load) and then tell the entire organization. That way, when something bad happens, you can explain that everyone agreed on the specific numbers. It’s unlikely your business will need to be (or can be) 100% perfect on all metrics, but people need to understand what the goal is and why it’s realistic. If at least one person is using your service, you should have two web servers. It gives you ton of flexibility. Having two boxes forces you to work out most of the issues early (it’s a lot different getting to 2 boxes than 3 or 4). It’s not about load, it’s about reliability. Downtime spreads very fast across Twitter. Consider tweeting about upcoming service interruptions ahead of time so customers are aware. After more than 15 people, you need a dedicated operations person. Get some basic monitoring services early – after a server is under load, it’s really hard to diagnose. Try to detect stuff early, it’s easier to debug. With startups, generally the problem tends to be slow requests rather than complete service downtime. Make sure your monitoring service will alert you with slow requests. Get app specific stuff – a warning like “High CPU load,” is harder to understand (it might be a problem, or maybe the machine is just handling a lot of requests successfully), but “Page X takes 80 sec to load” is more obvious. As you grow, try to measure more and more. Things often degrade slowly, and one day you just notice its too slow and it’s hard to go back and find the root of the problem. Make two lists: a) the most catastrophic things that could happen and b) the most likely things that could happen. Where those lists overlap, you need to fix something. But there will be some risks that you decide are reasonable risks for the business (revisit these risks regularly as things change). Regarding backup – always make sure you try to restore some data (before you really need it). You need to make sure it works and make sure its fast enough. You should always be able to describe at a high level how the service will scale infinitely (it doesn’t have to be technically perfect, but it has to be believable). When someone wants to purchase, that’ll be a huge help – the business guy on the other side of the table will want to buy, but the technical guy doesn’t want to buy (he wants to build it in-house). Considering you can clearly see the Devver logo on Dan’s shirt, I think this needs to be in all our future marketing material. 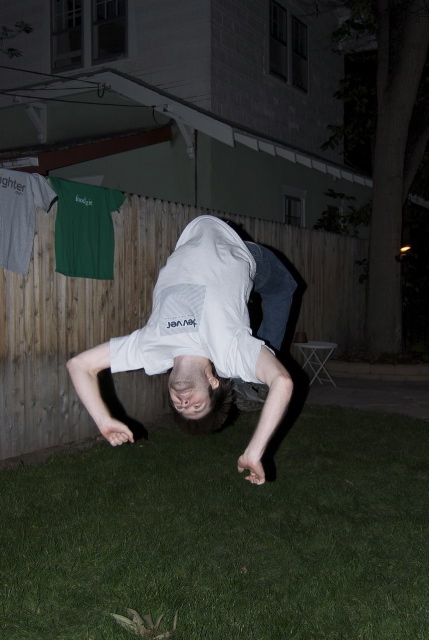 Nothing says “developers love Devver” like a developer doing a backflip in excitement. Awesome stuff. TechStars has been an amazing group to be a part of. We have frequently been asked about the program and “what is the best part of the TechStars program?” It is really hard to break it down to any single point, but all the benefits come back to being all about the people. We have received a ton of help from everyone in the program. We want to thank all of the mentors and sponsors involved with the program. TechStars really brings an amazing group of people together. We of course want to thank the original founders of TechStars – you have helped to build a really unique and engaged tech community in Boulder. We want to give mad props to all of the other TechStars 08 teams. Some of the best advice we got came from the other teams. So thanks goes out to Occipital, Gyminee, App-X, TravelFli, Ignighter, People’s Software Company, Foodzie, BuyPlayWin, and of course The Highway Girl. We also got some great advice and feedback from some of last year’s teams. Thank you to Ari from Filtrbox, Rob and Josh from EventVue, and the entire team with Socialthing!. Last, but not least, we wanted to give a final thanks to some of the mentors that we spent additional time with. We really appreciate the advice, feedback, and laughs… thanks to David Cohen, Tom Higley, and Seth Levine. Congrats to everyone for making TechStars such an amazing ride. We know that even though the program is over we will still be getting advice from many of you and still be working with the kind of determination that TechStars helps foster.